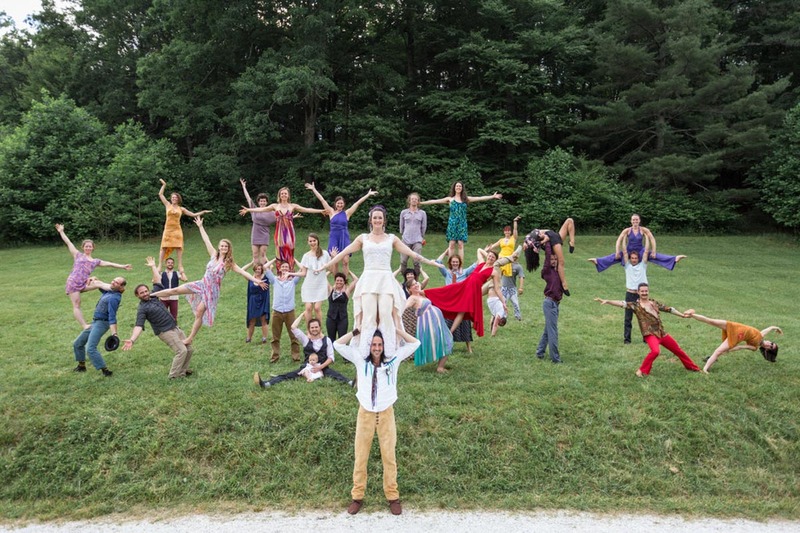 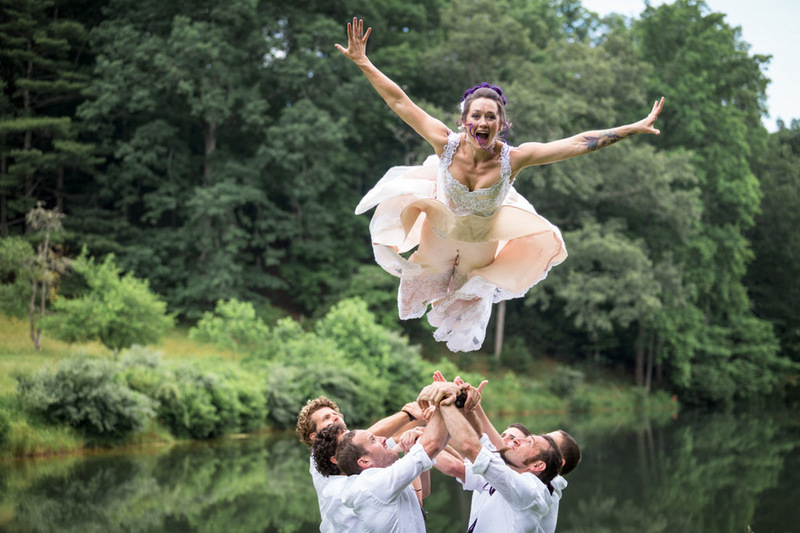 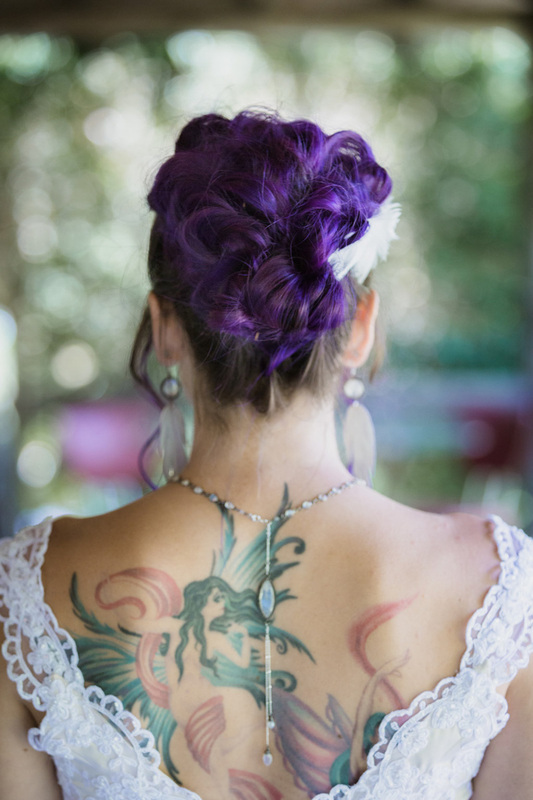 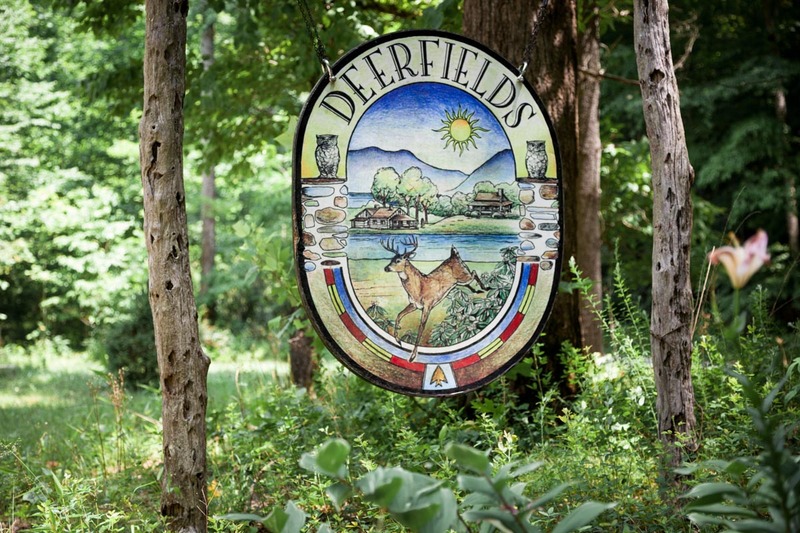 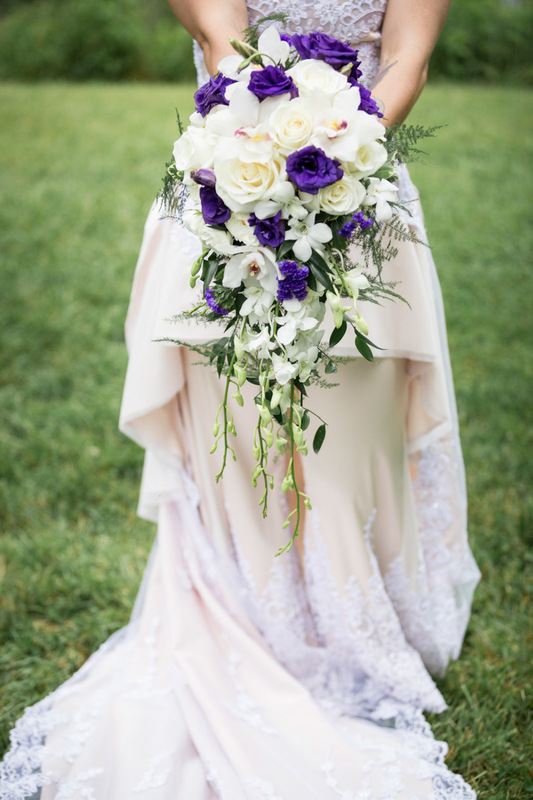 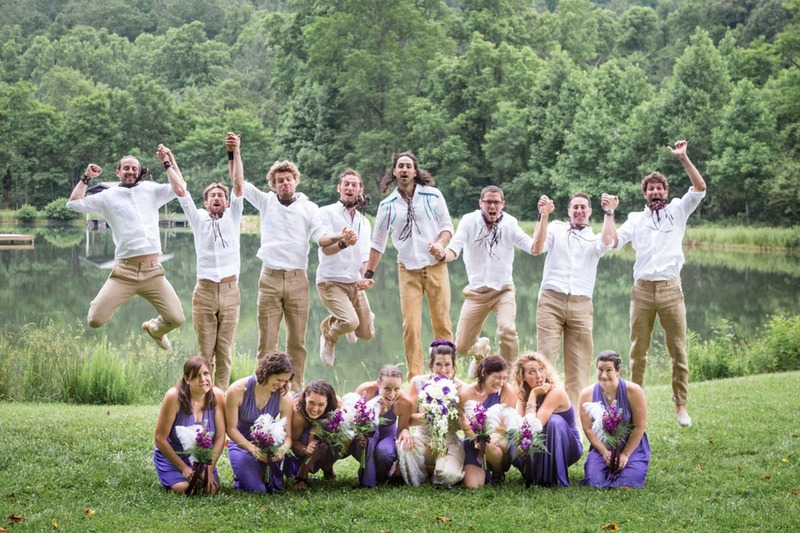 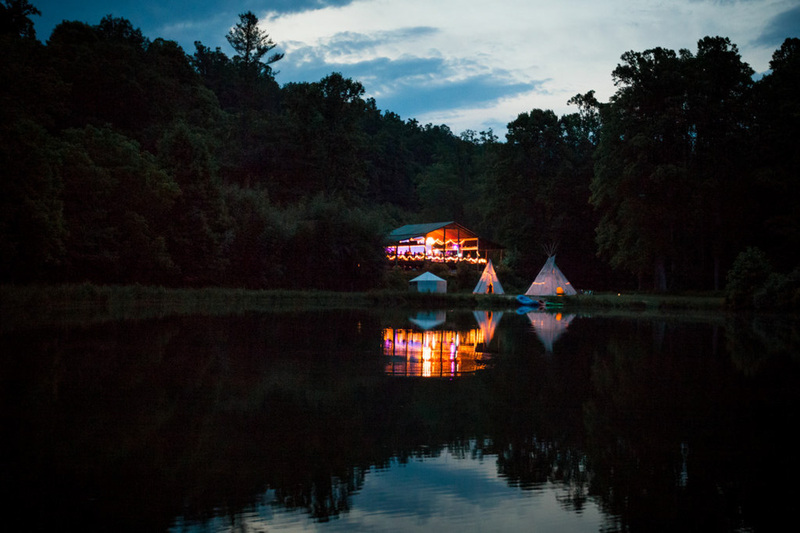 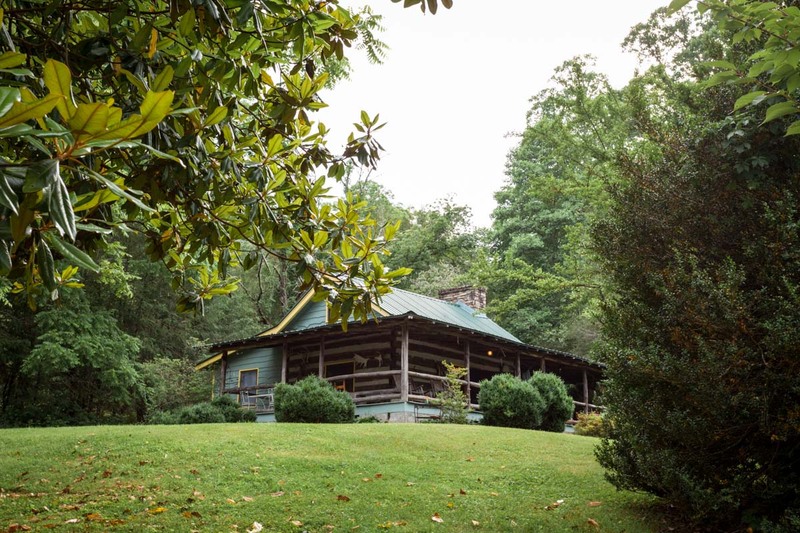 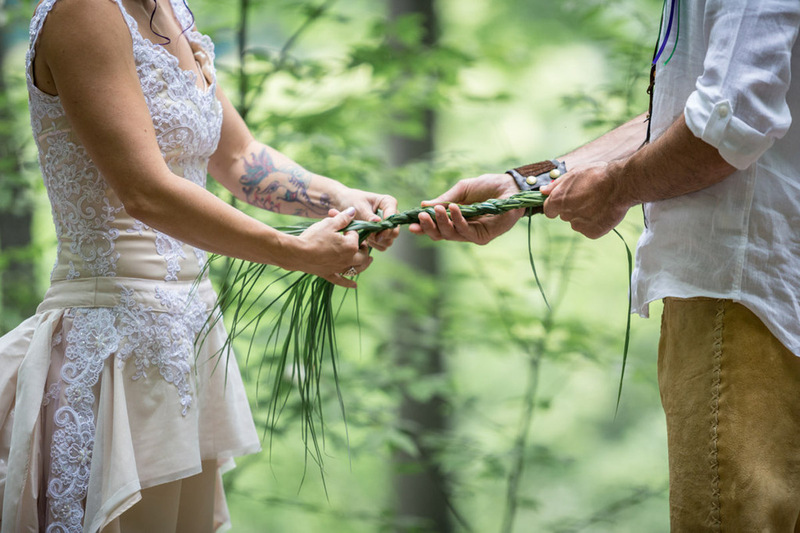 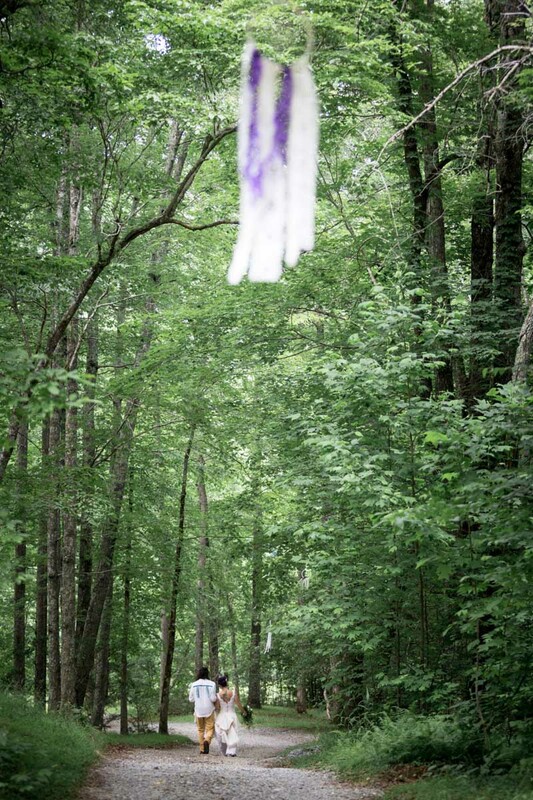 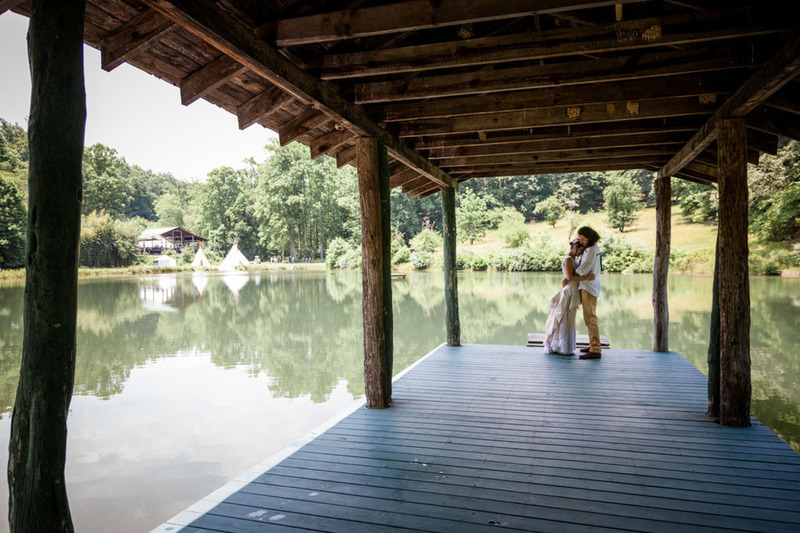 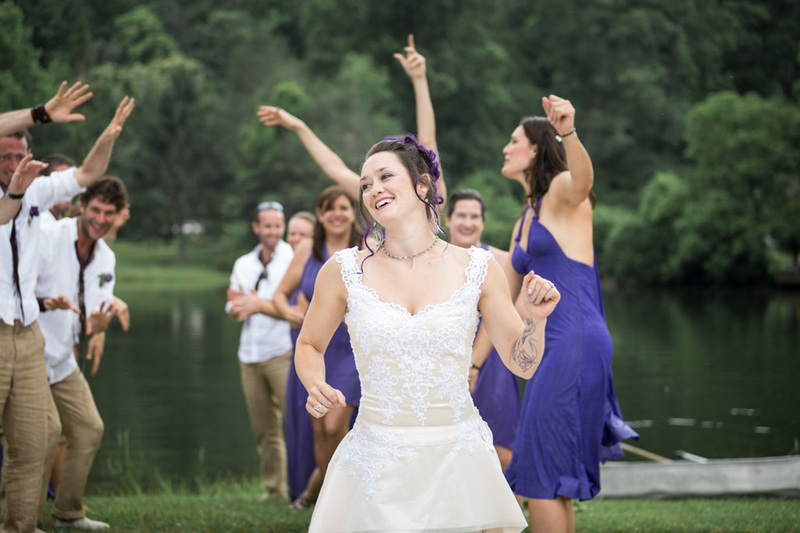 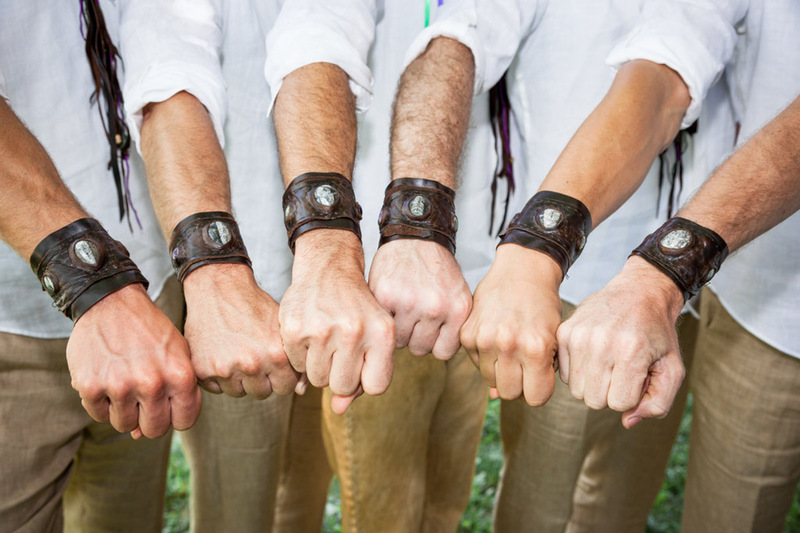 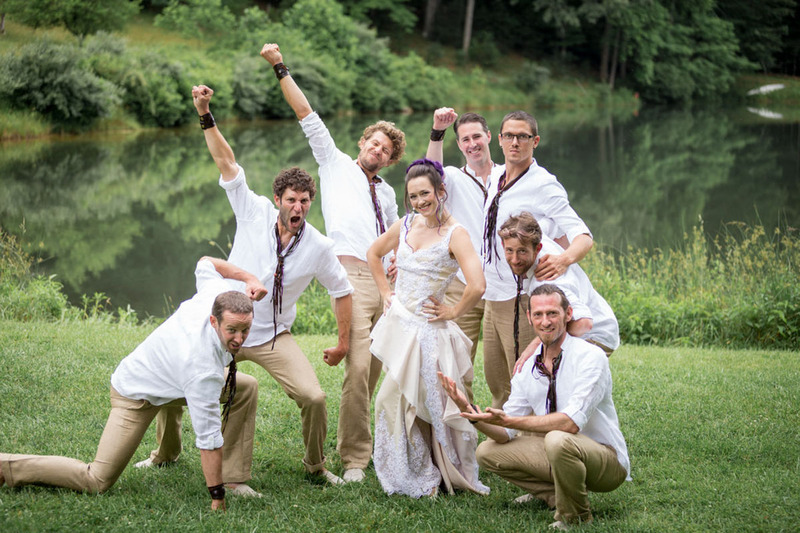 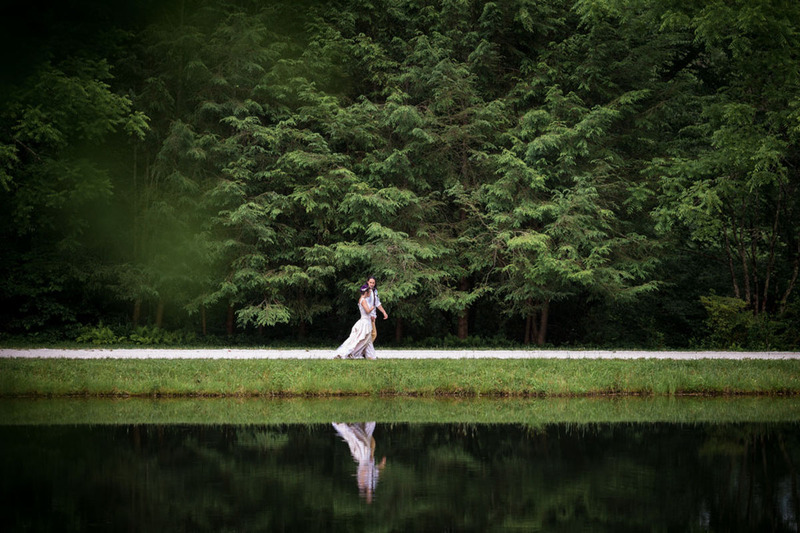 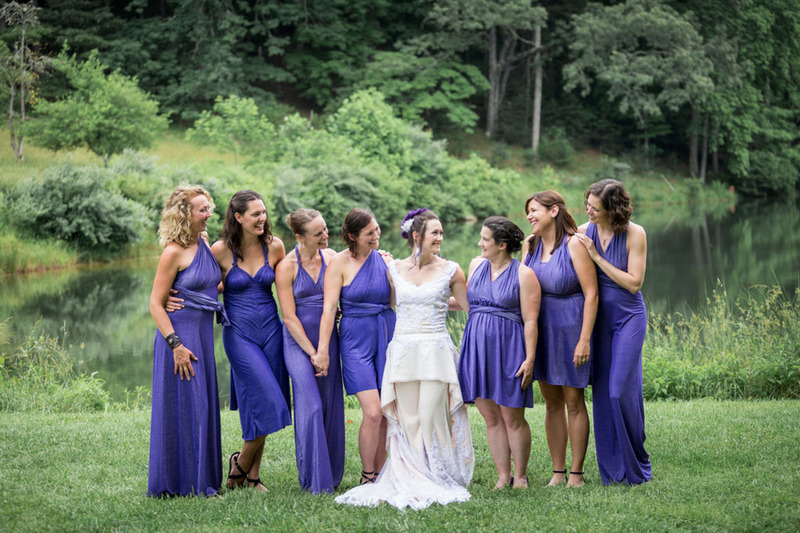 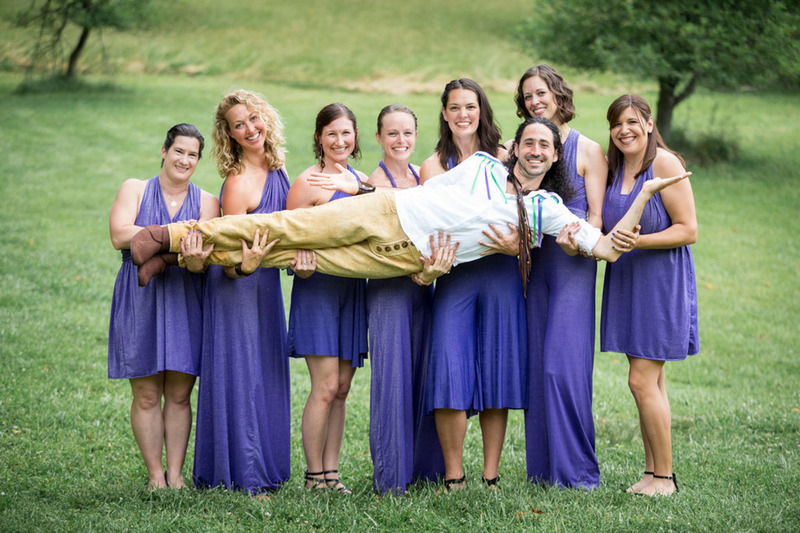 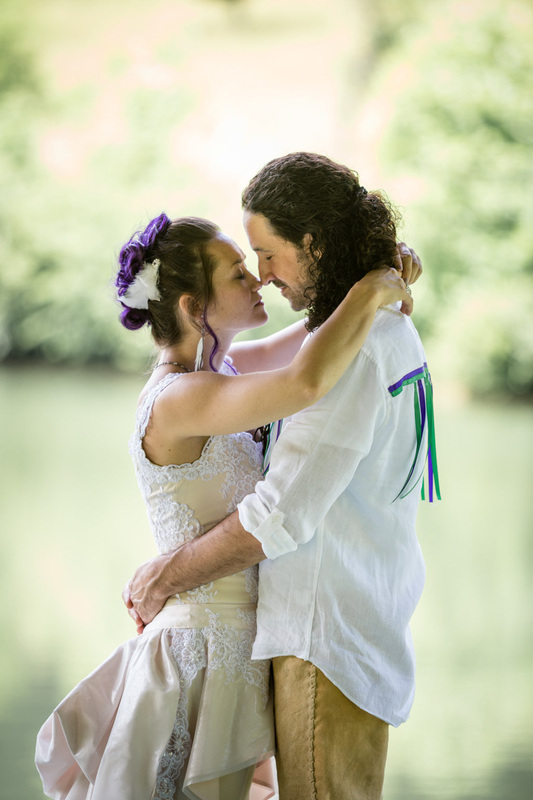 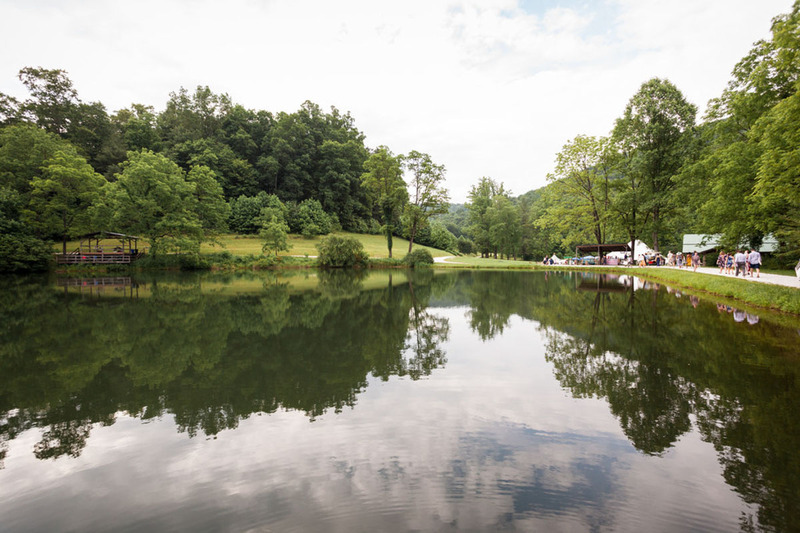 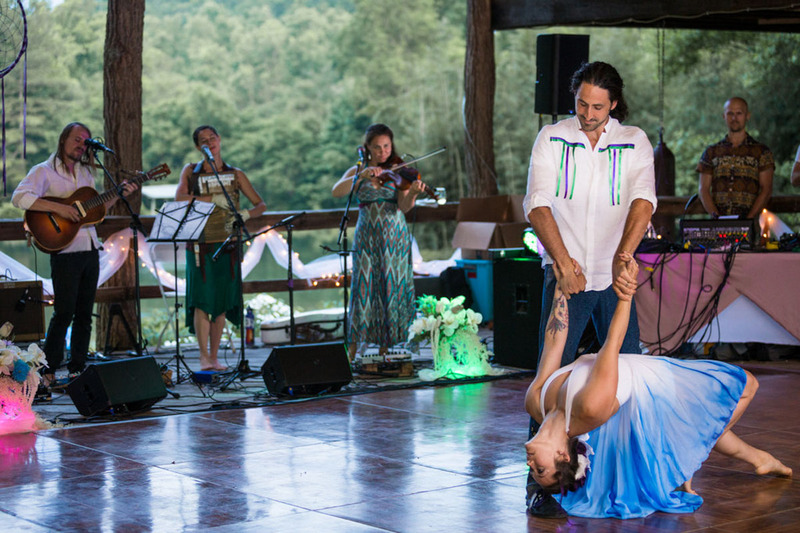 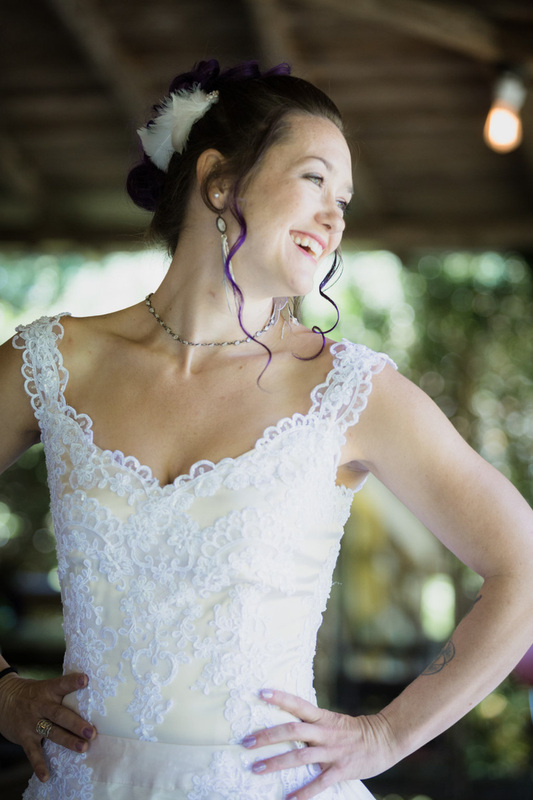 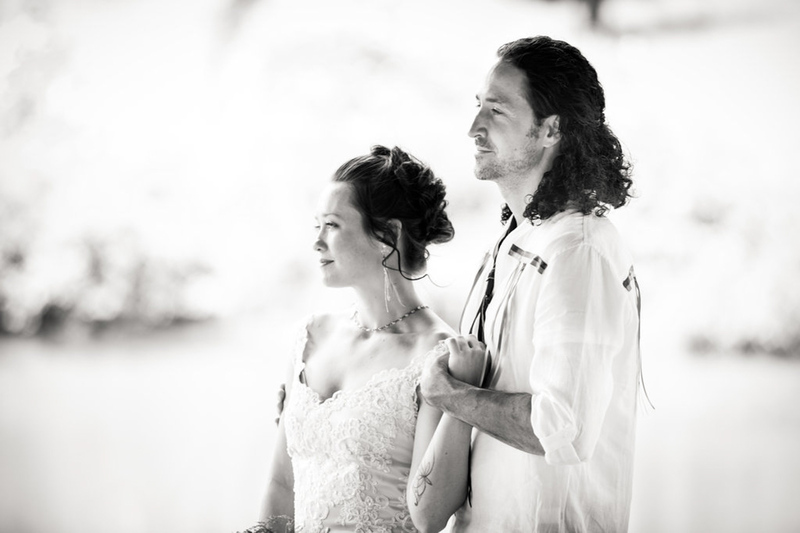 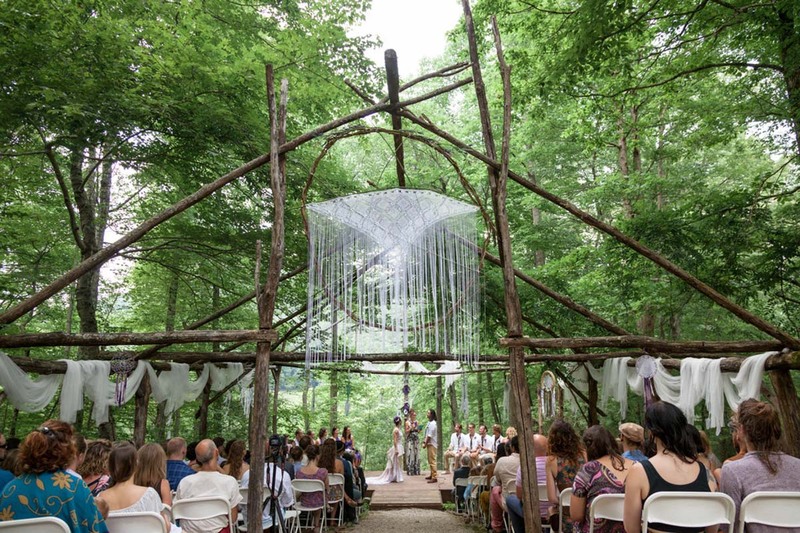 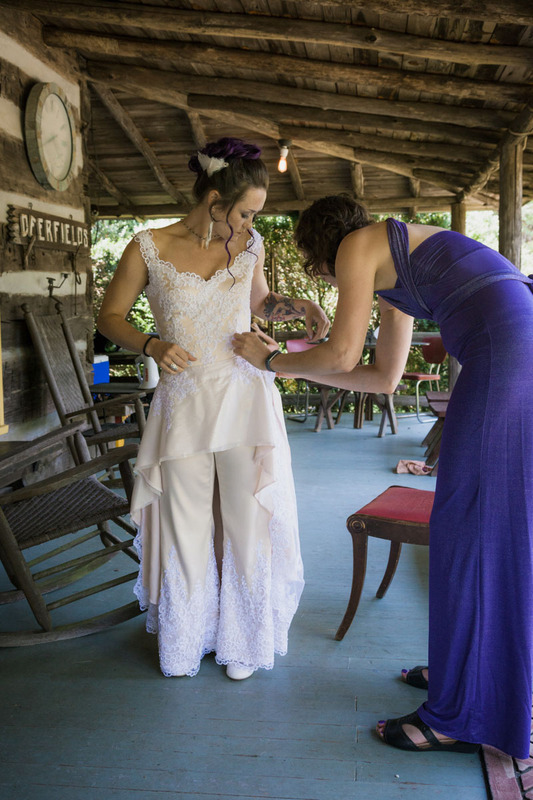 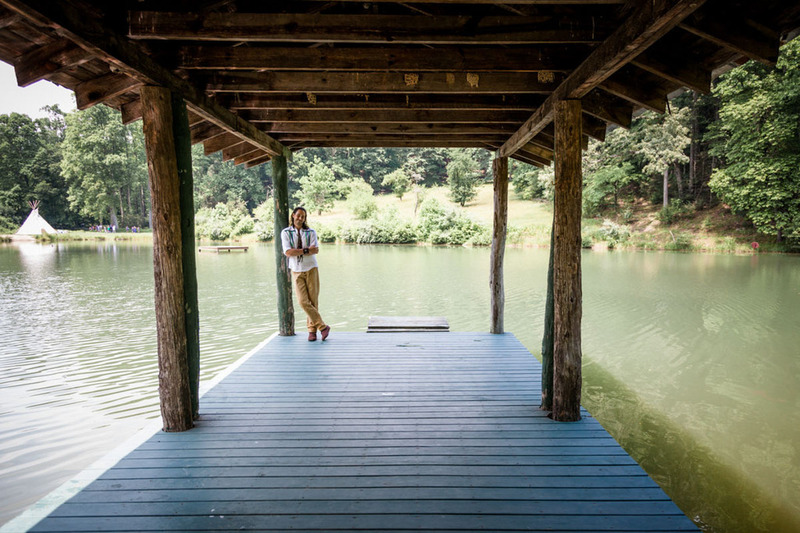 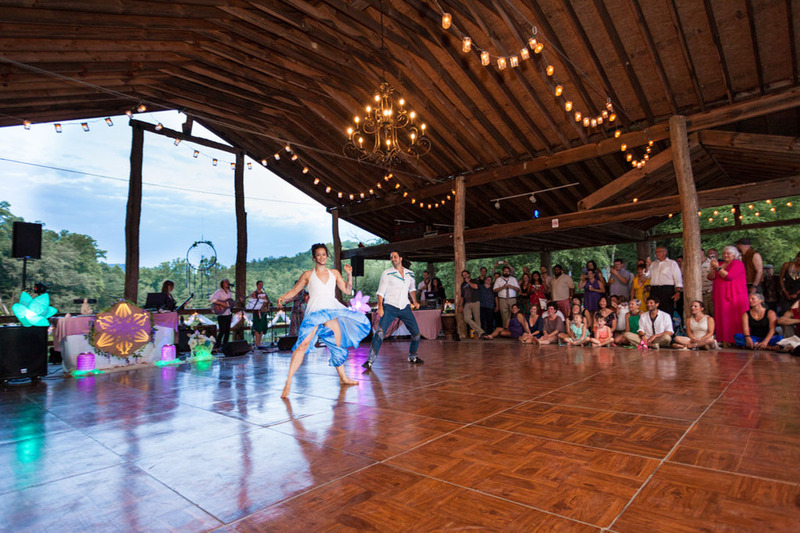 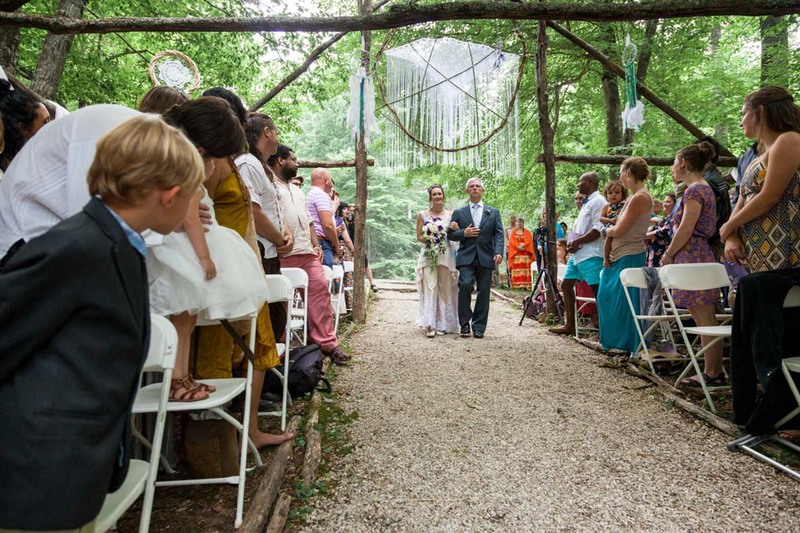 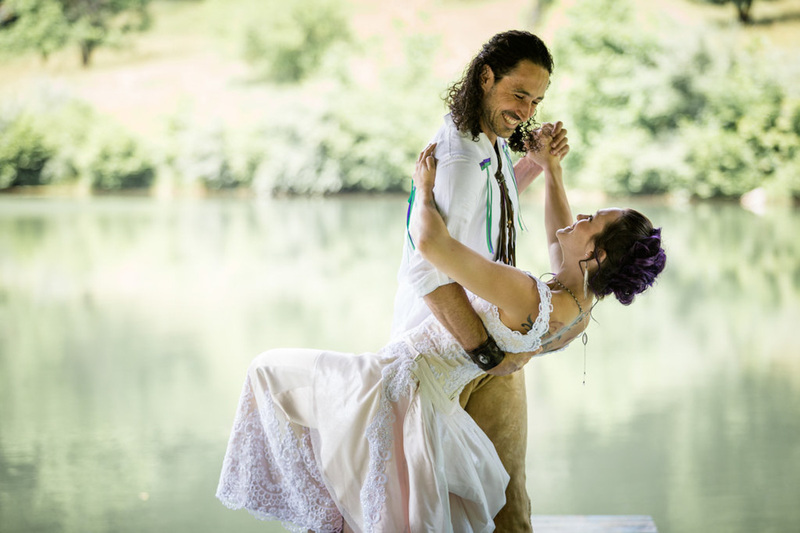 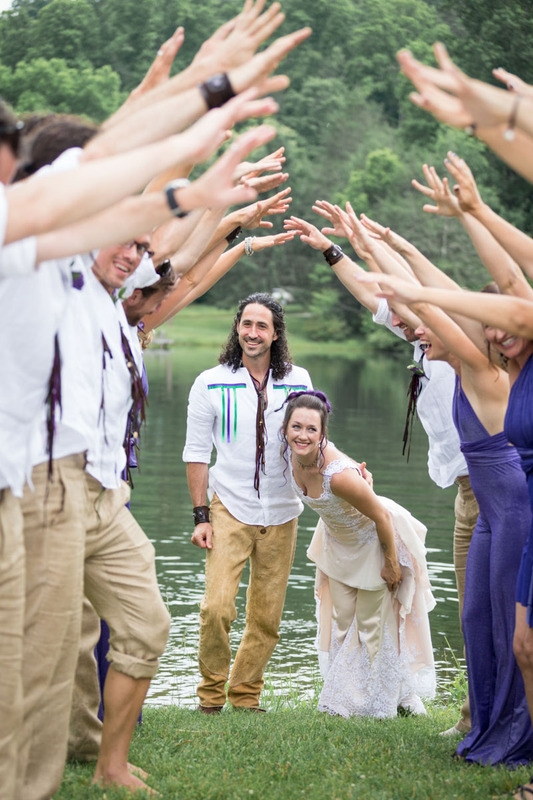 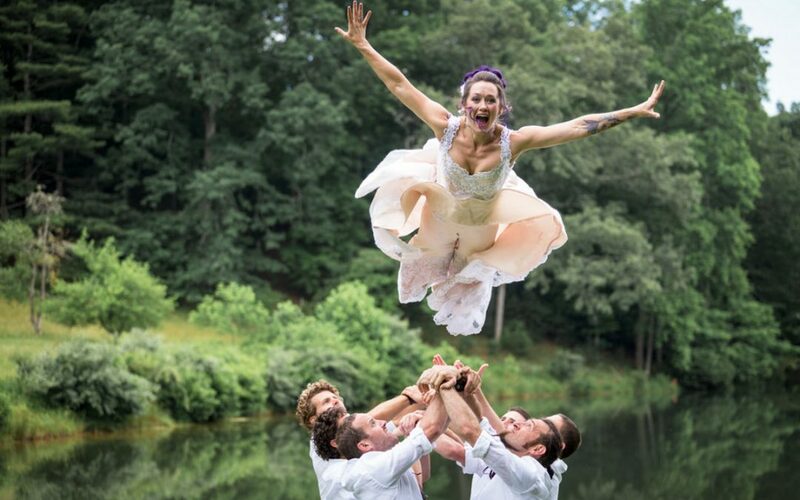 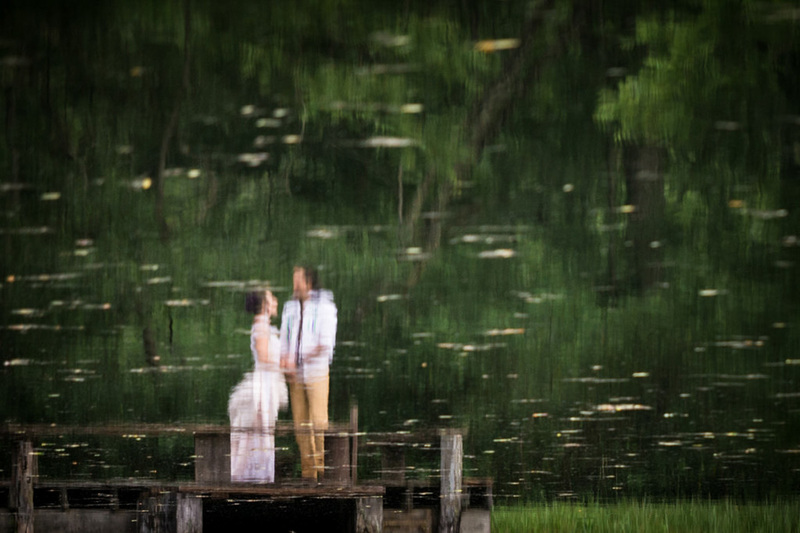 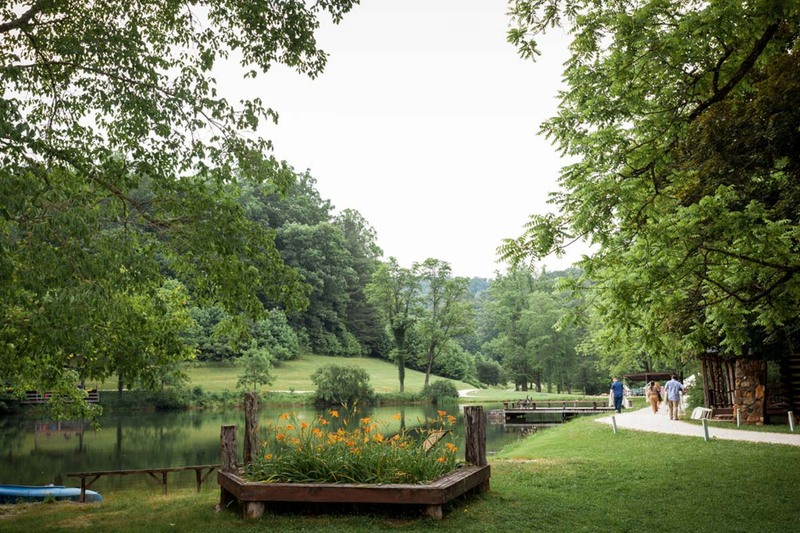 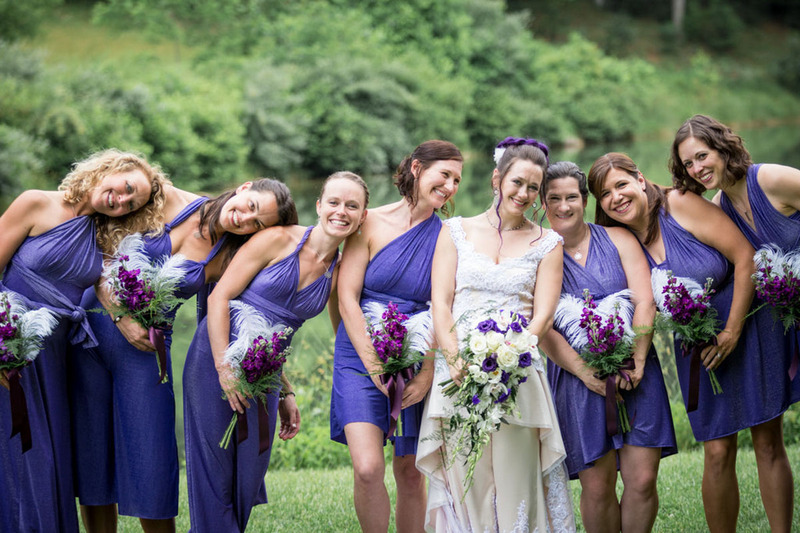 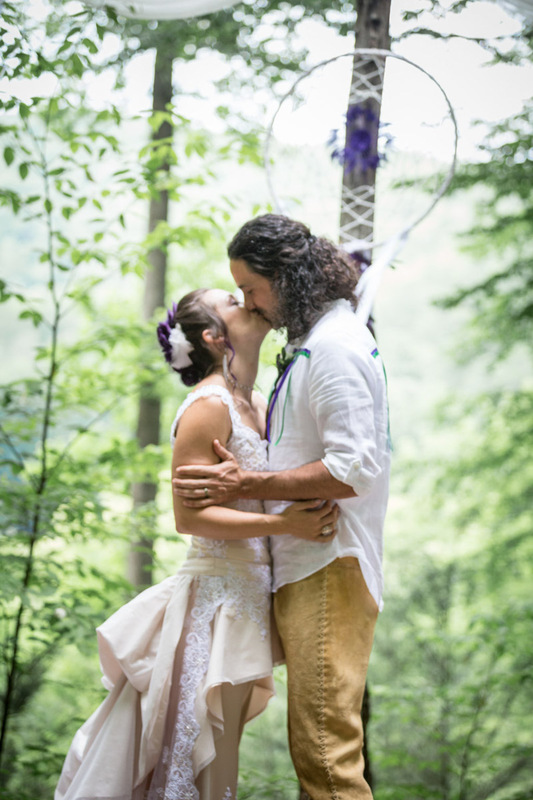 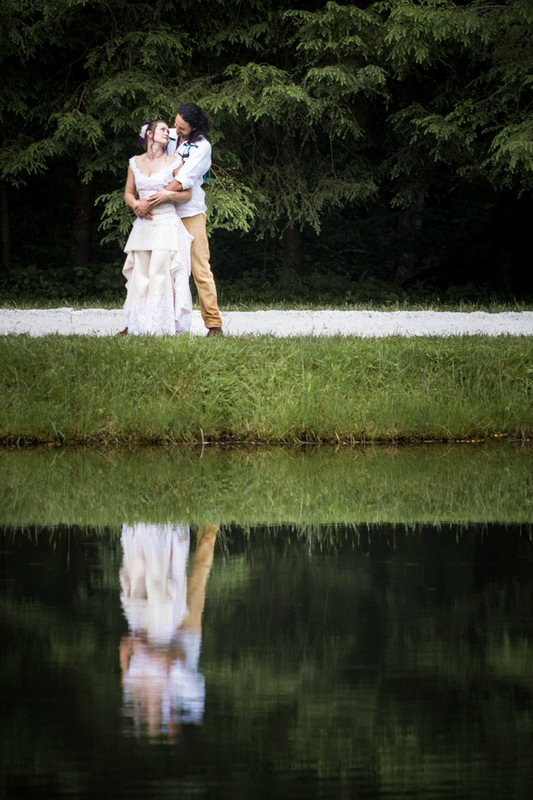 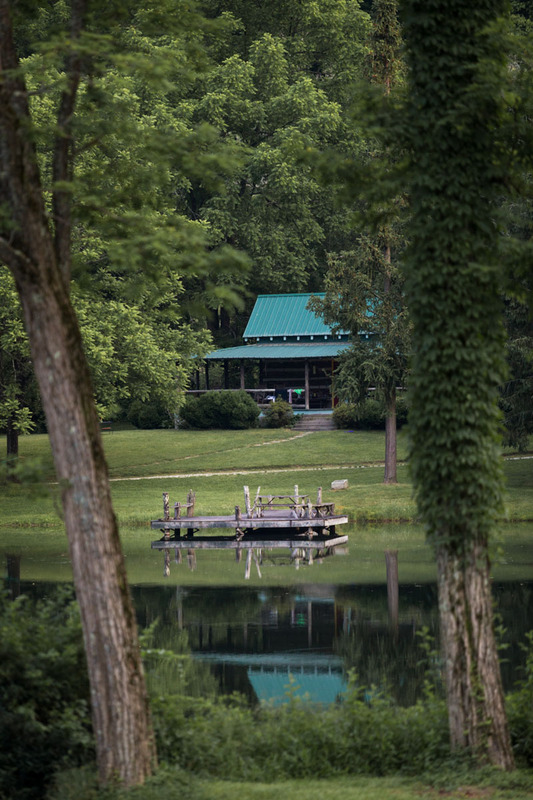 Cassie and Brady’s wedding day was tucked in the middle of a 3-day weekend getaway, with friends and family from near and far staying onsite at Deerfields Retreat in Horseshoe, just outside Asheville NC. 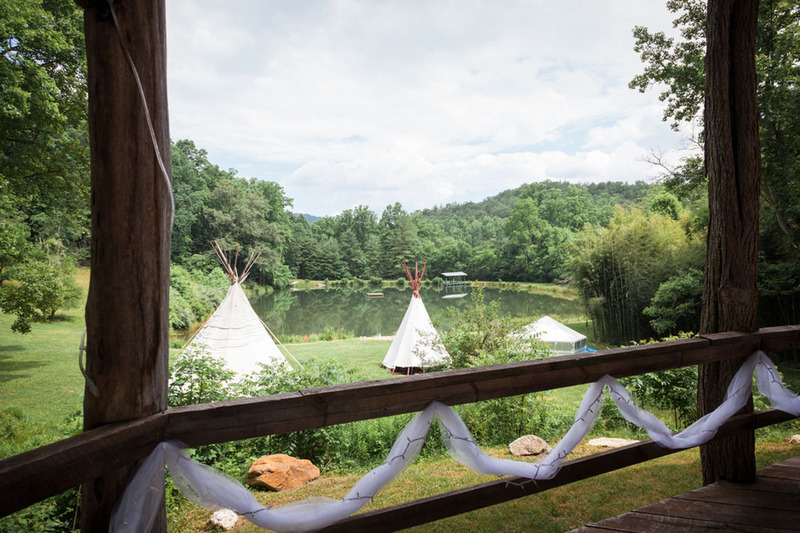 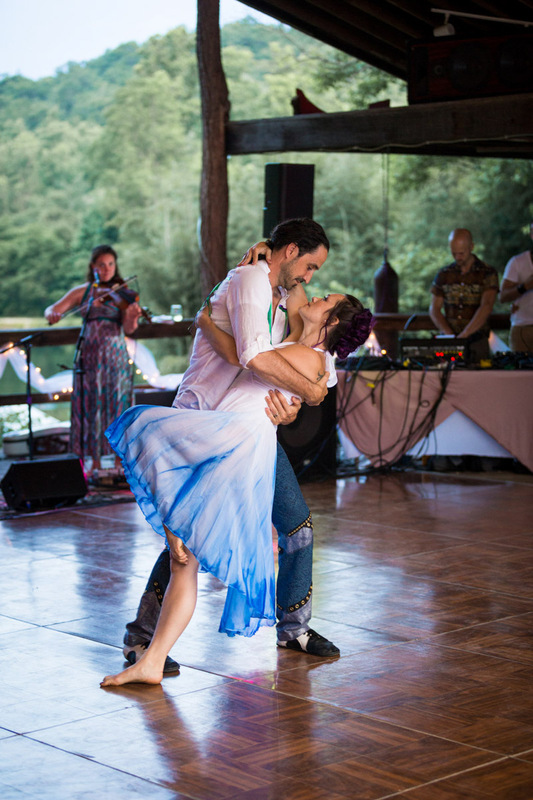 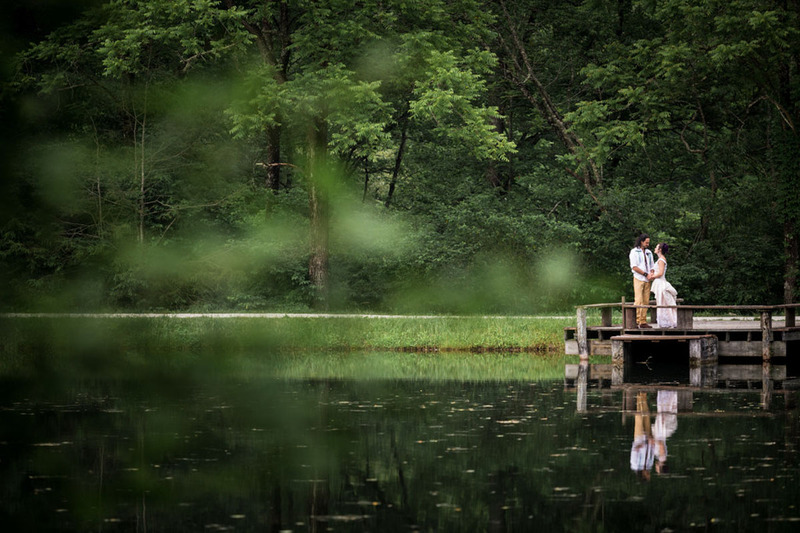 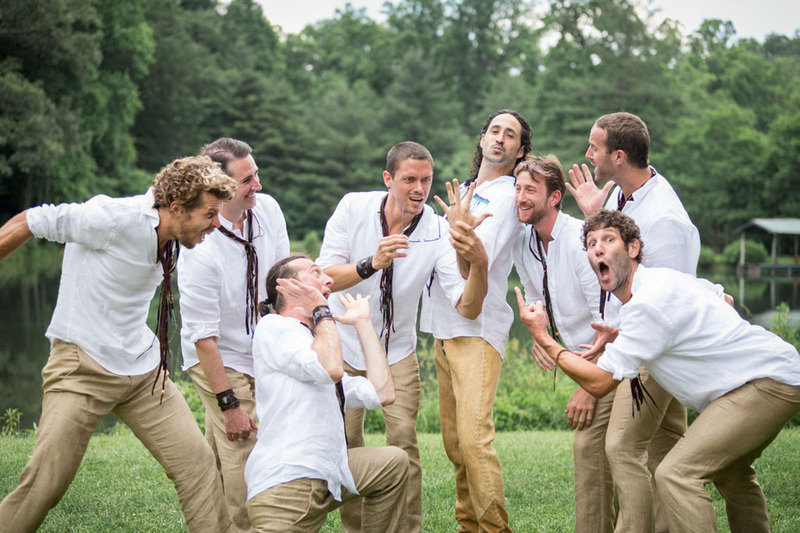 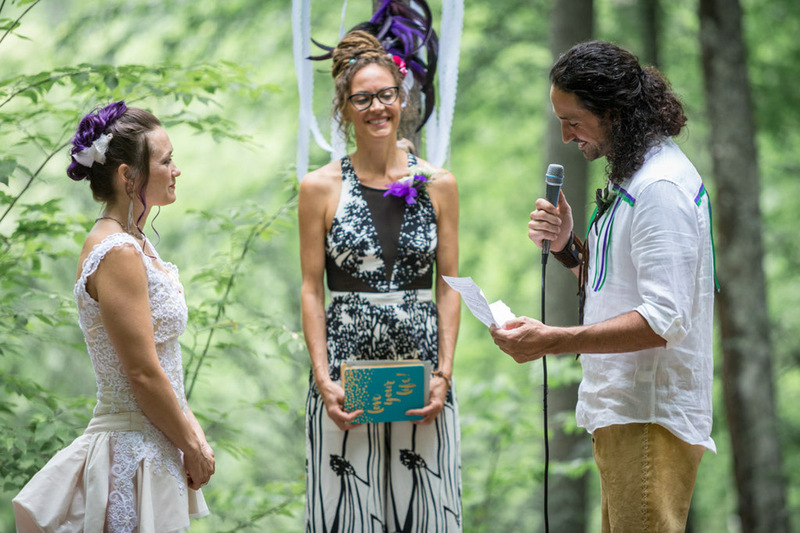 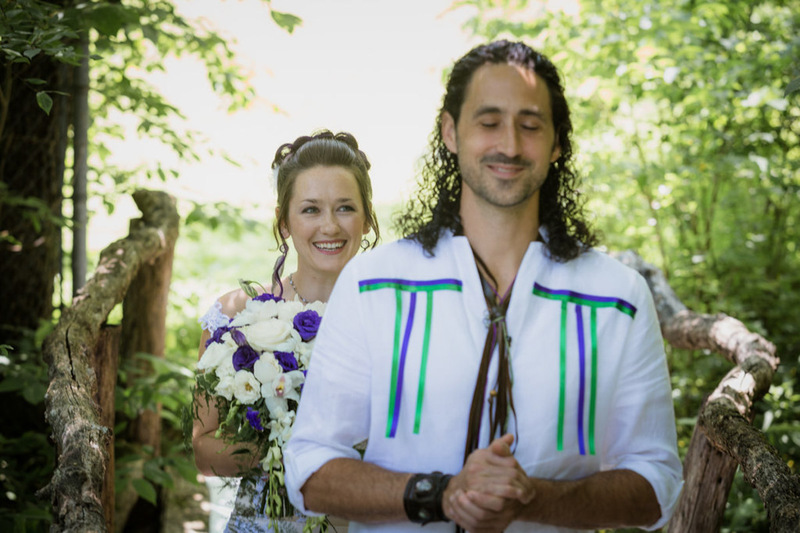 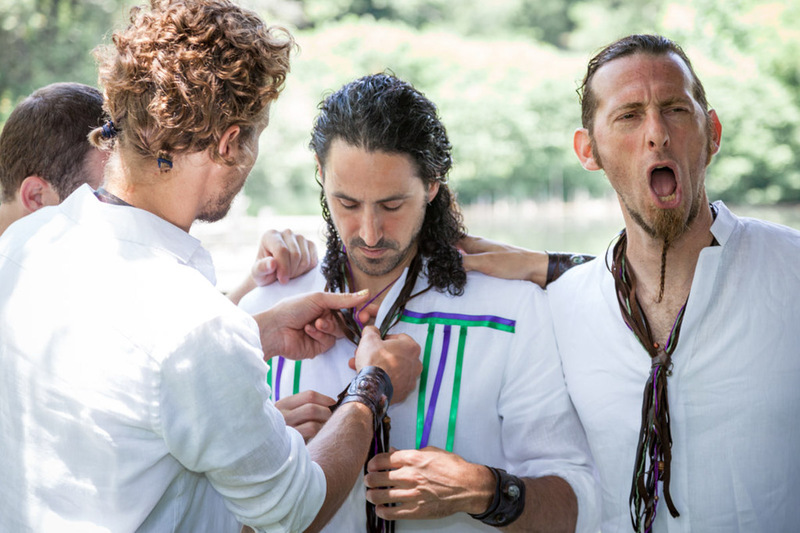 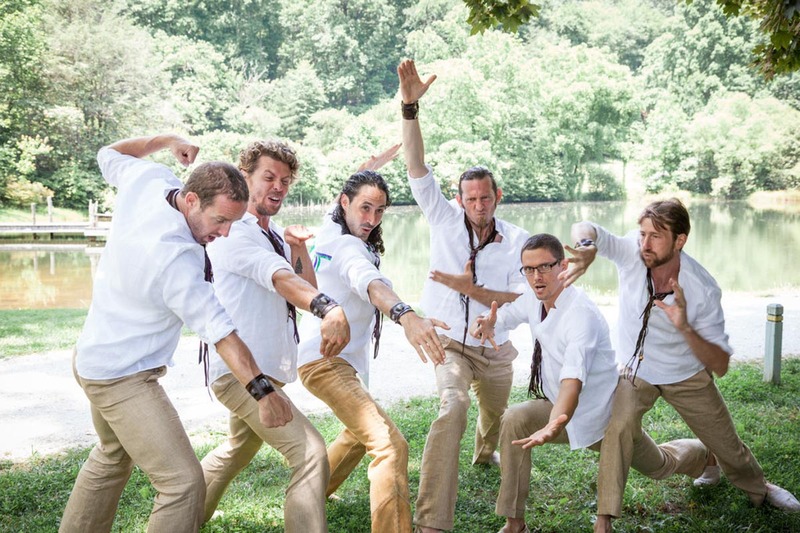 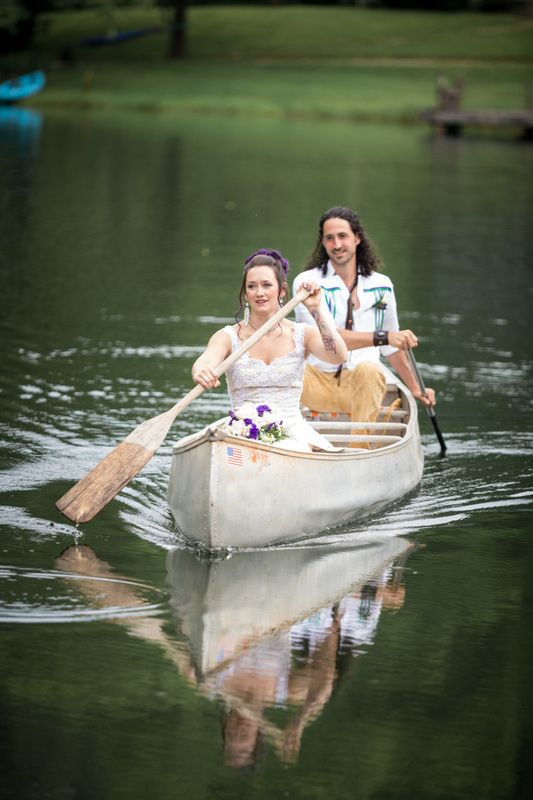 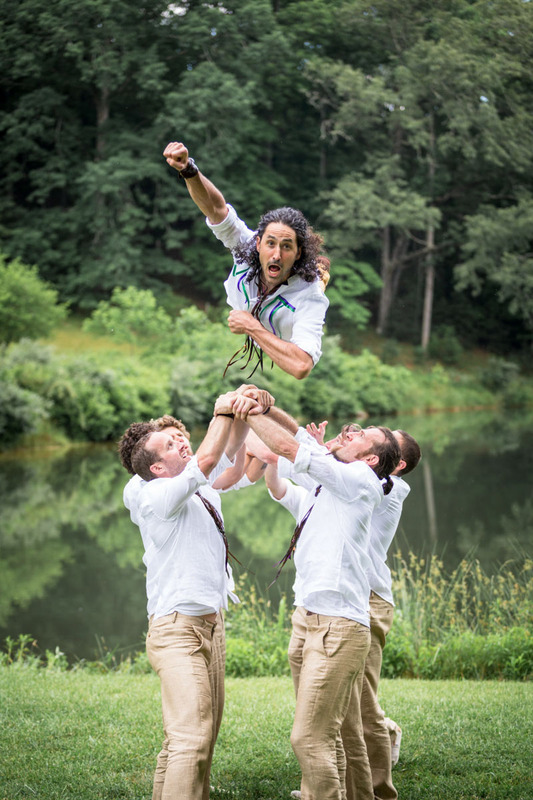 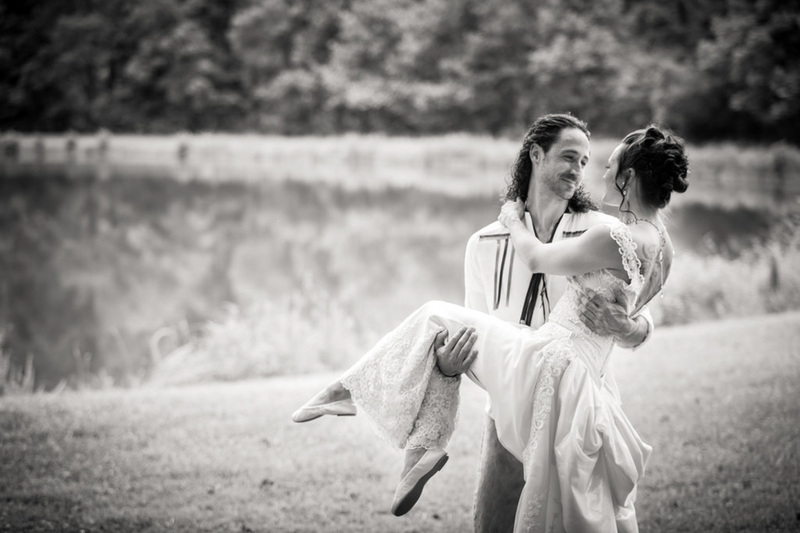 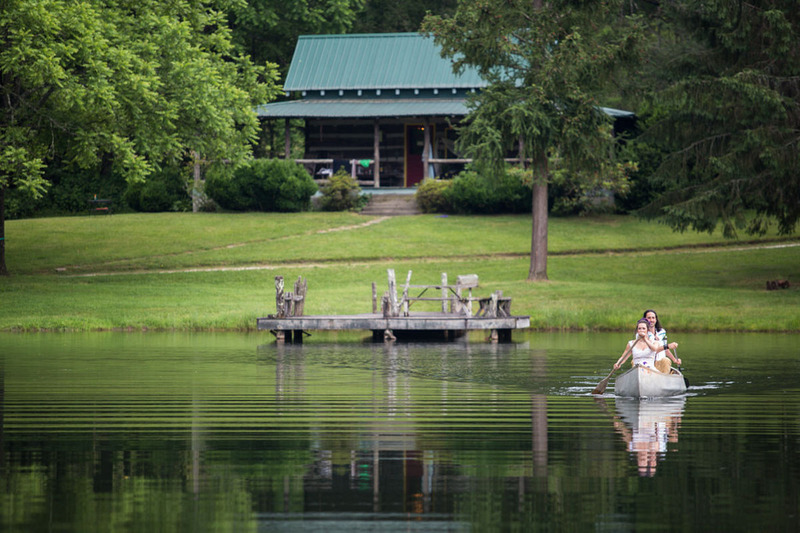 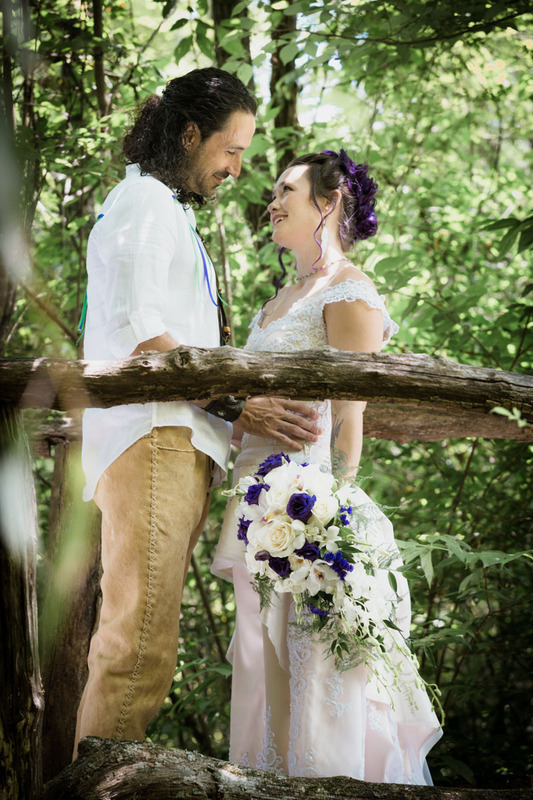 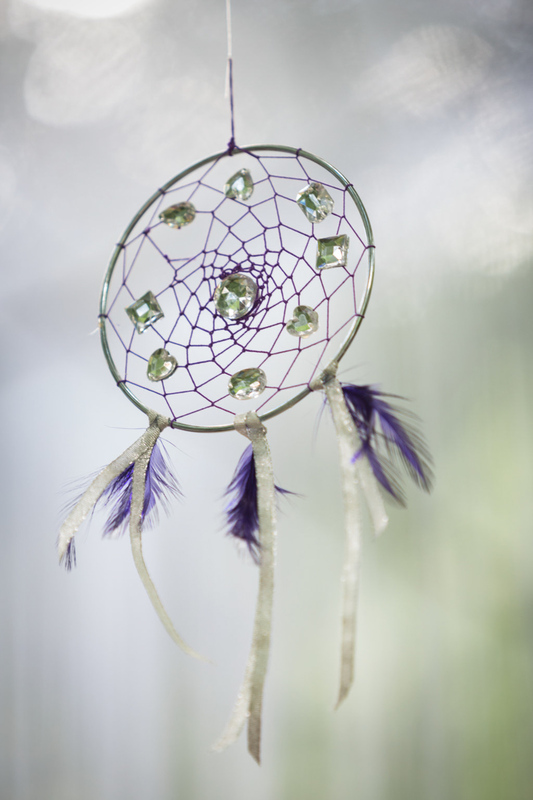 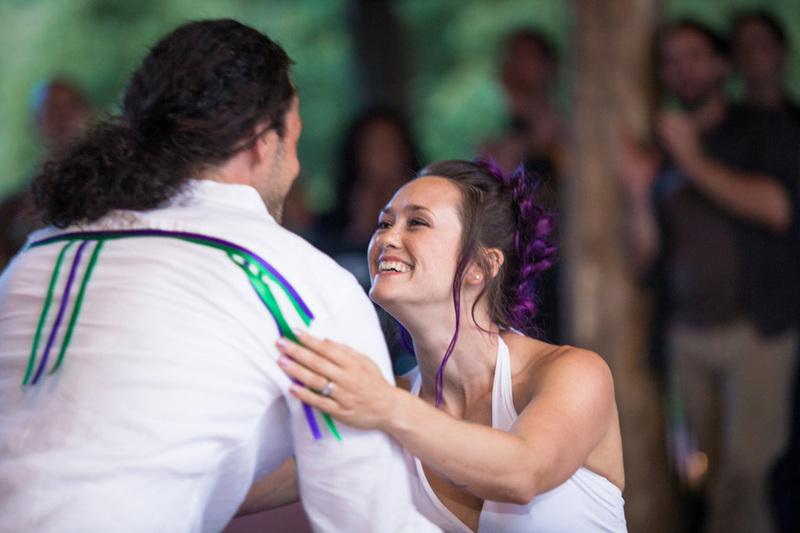 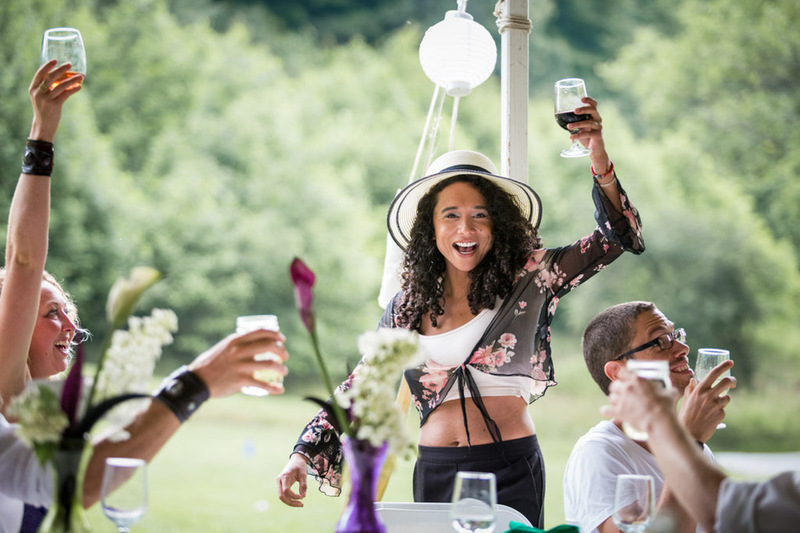 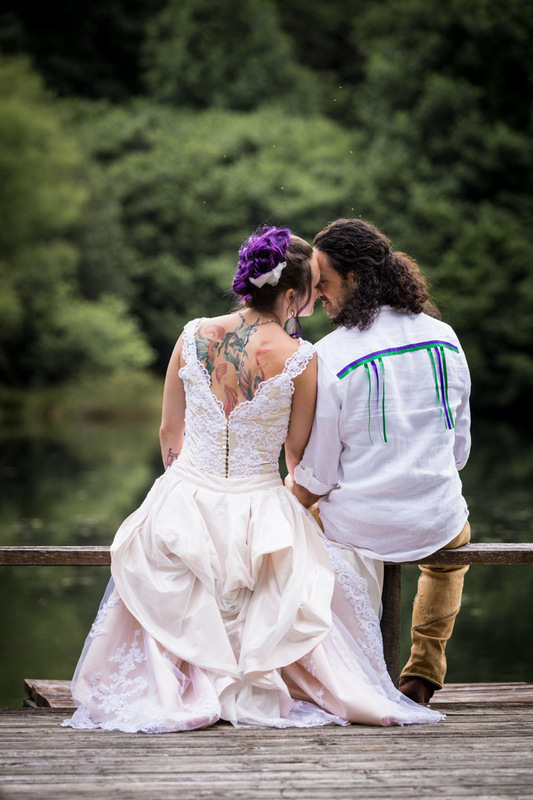 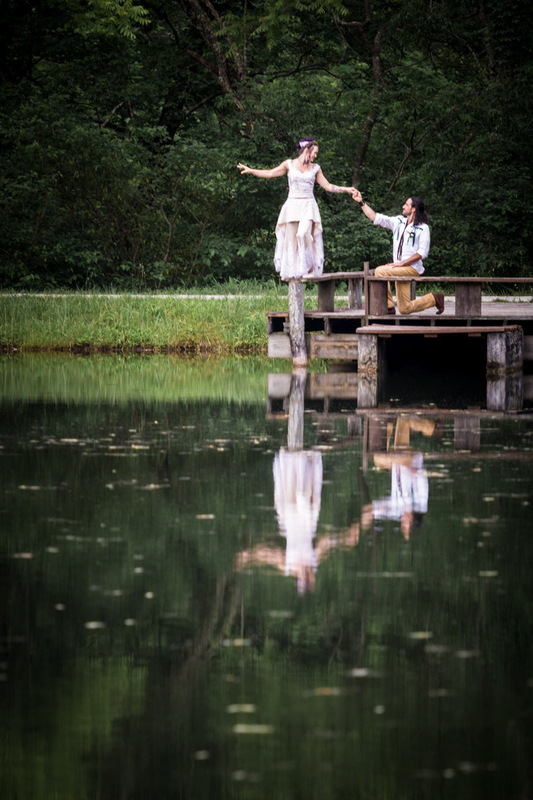 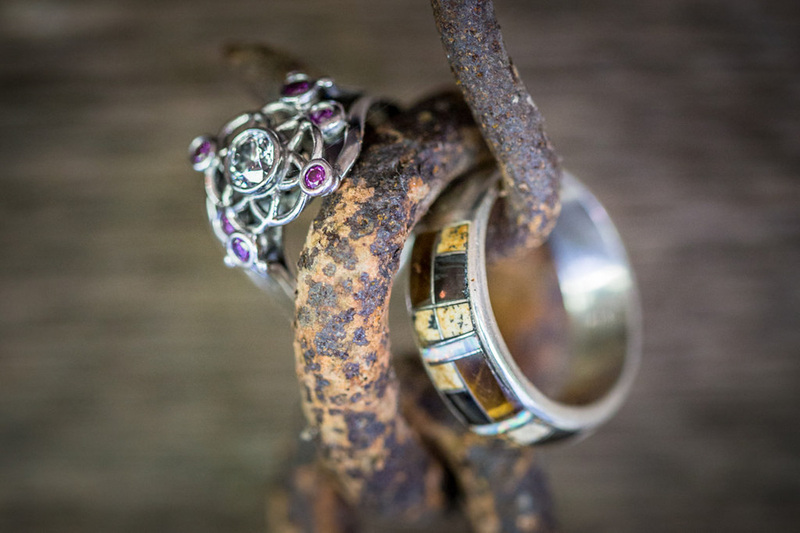 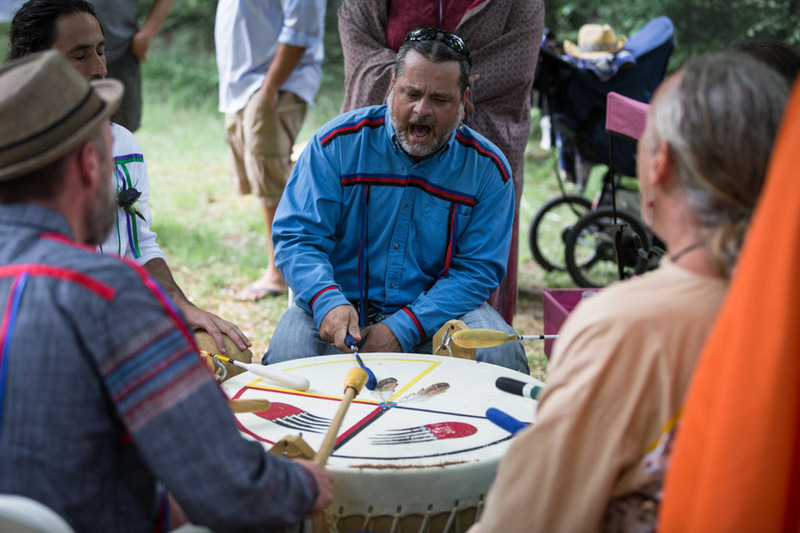 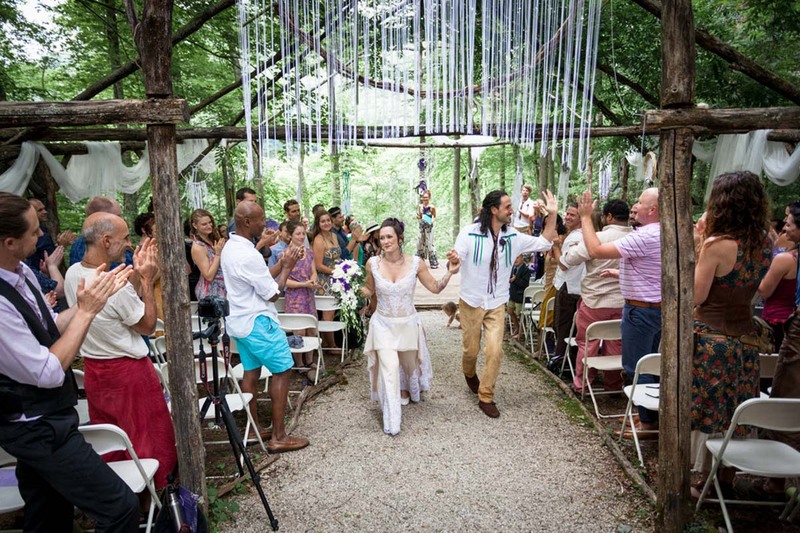 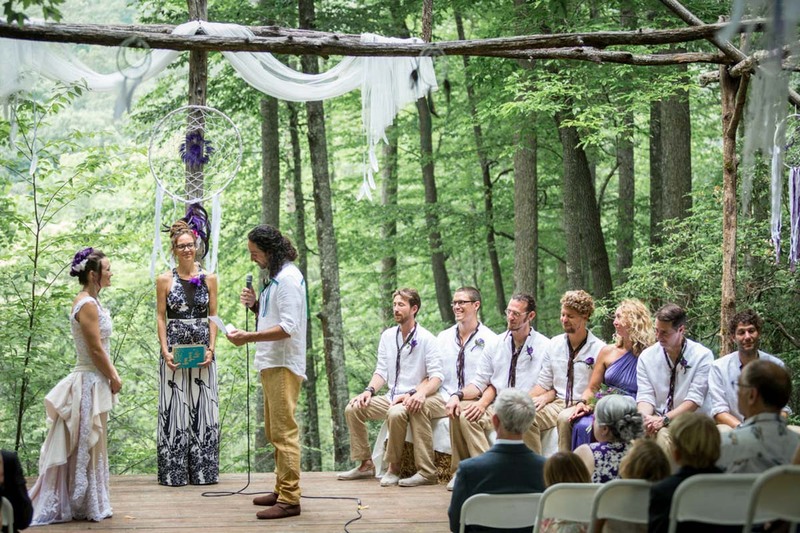 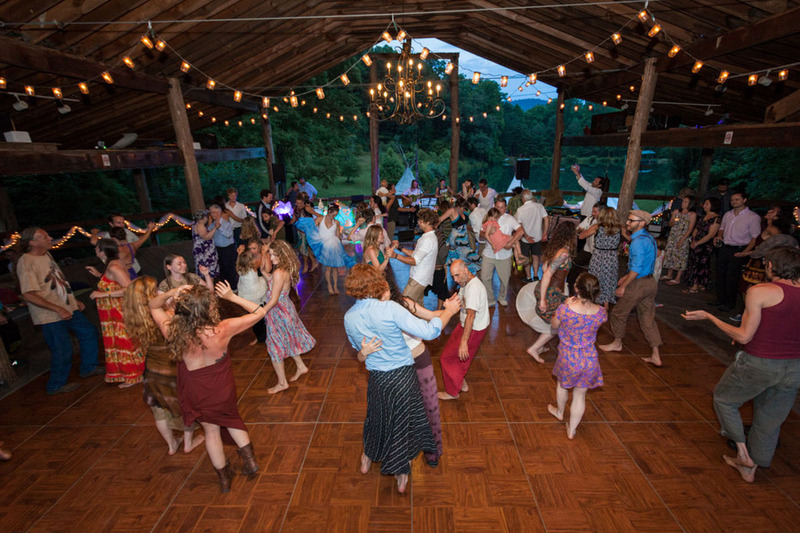 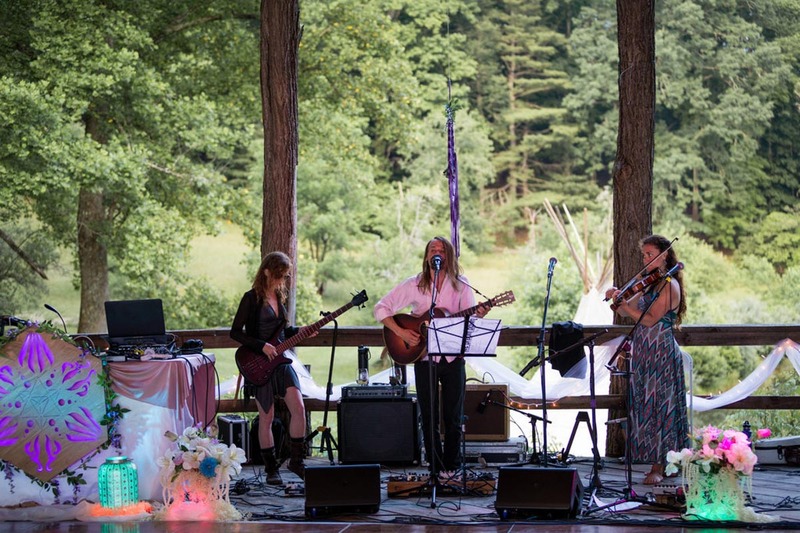 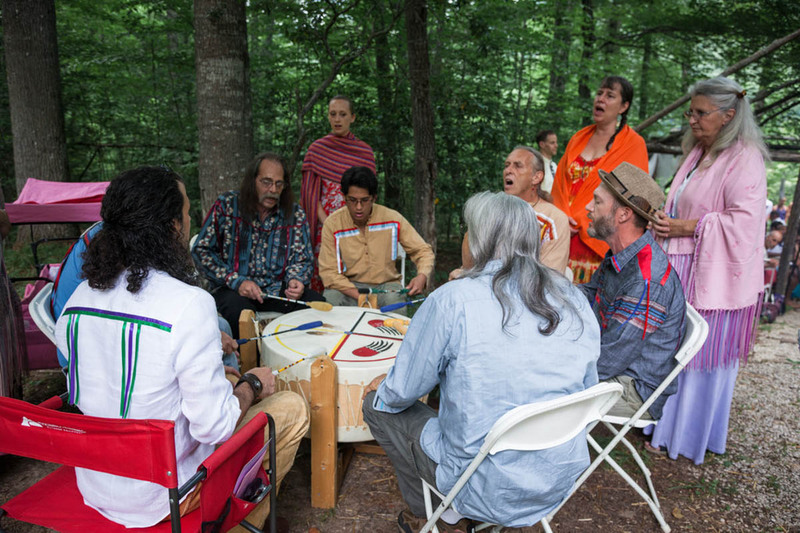 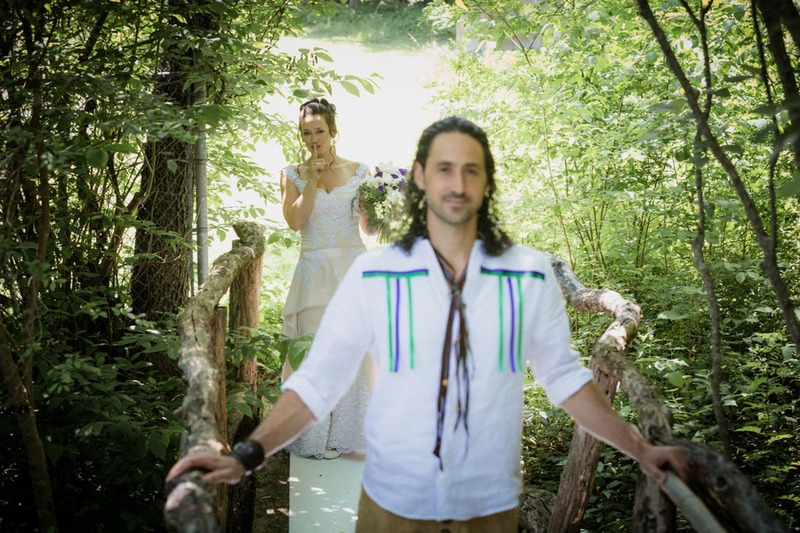 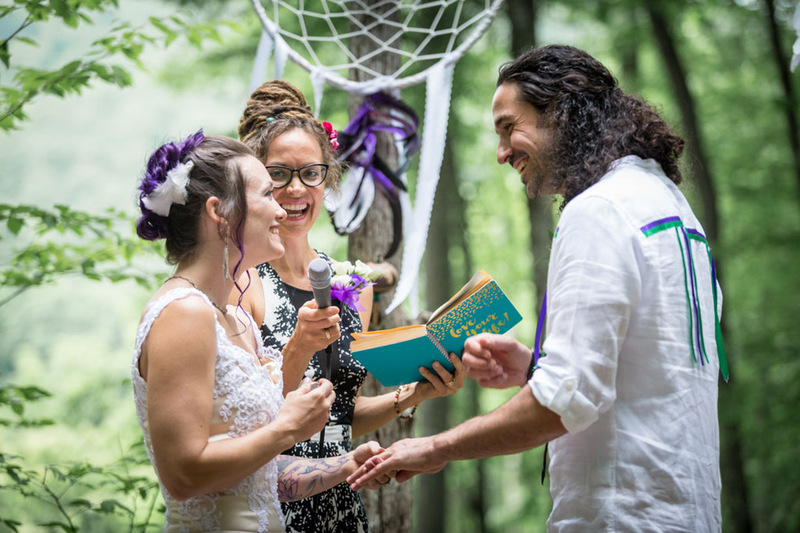 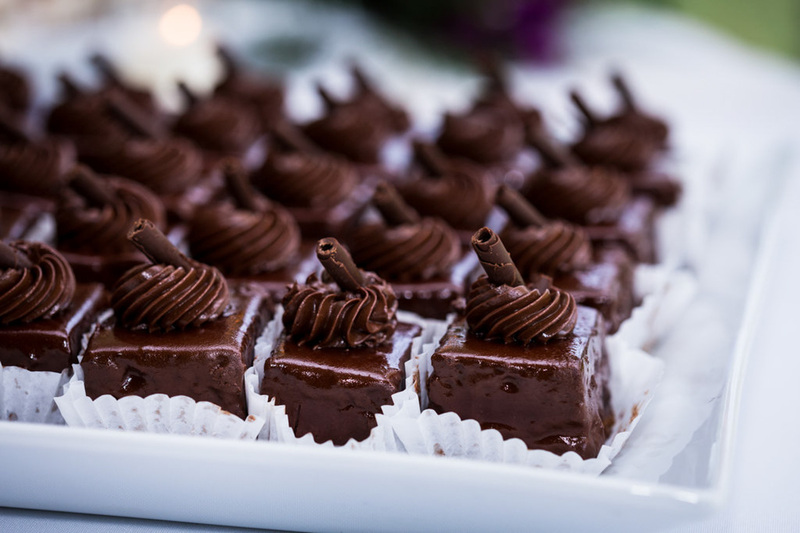 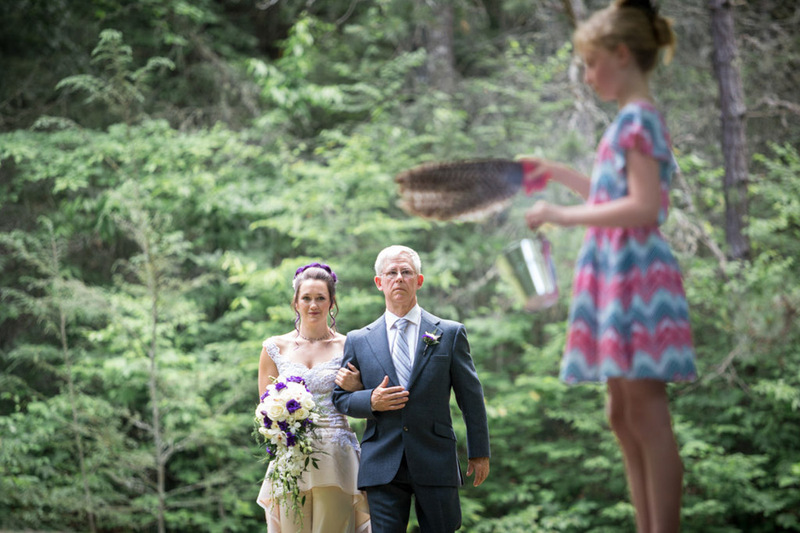 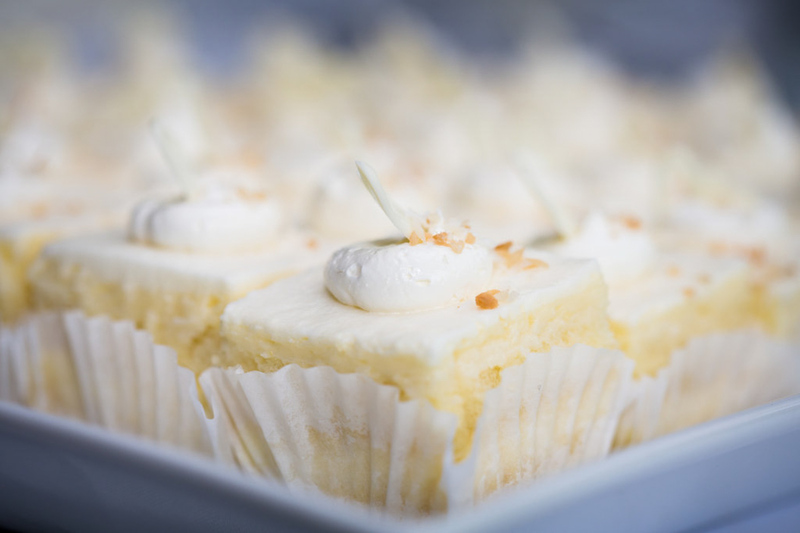 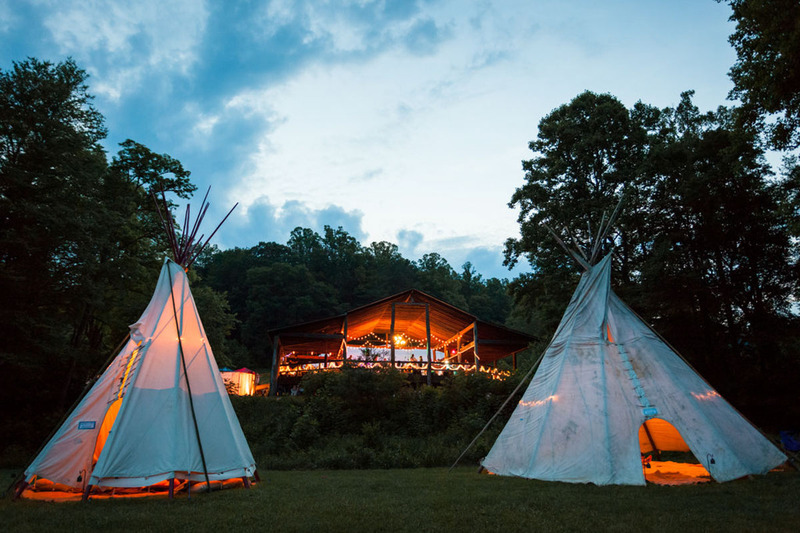 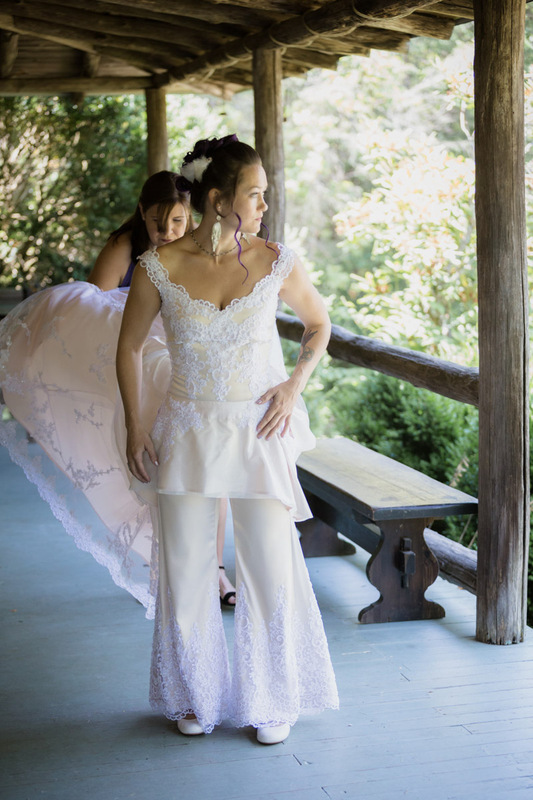 The laid-back vibe on wedding day was a sure giveaway that folks had already been enjoying the cabins, grounds, campfires, lakes and outdoor fun as the close-knit community vibe infused the summer air. 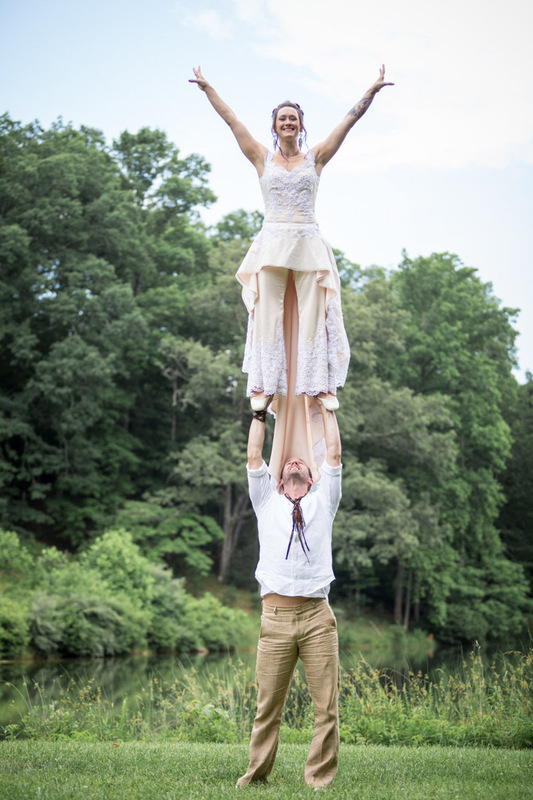 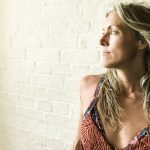 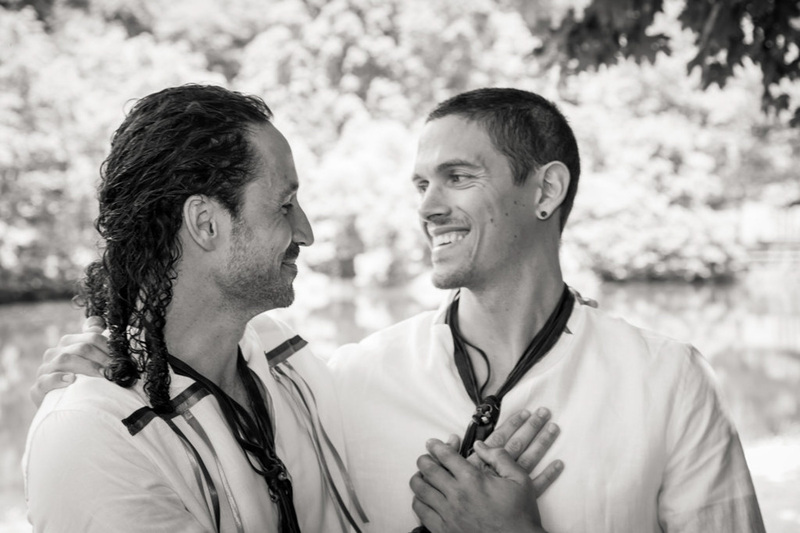 Cassie is a longtime aerialist, acrobat and acro-yogini, and Brady is a formidable partner in all those aspects, plus a bodyworker to soothe all the muscles that toss, twist, and catch. 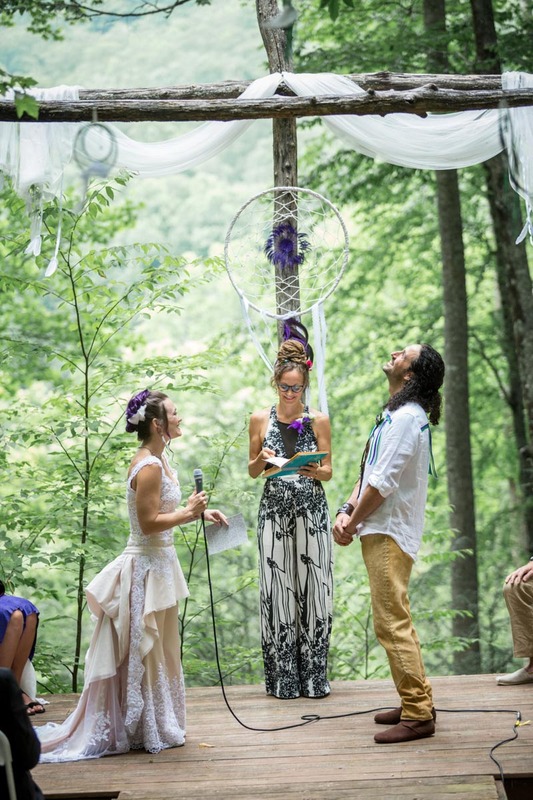 The ceremony was held under an open-air “cathedral” where Cassie wore a stunning one-of-a-kind custom made 2-piece pants/dress combo by Erica Martin of High Flyer Fashion and Brady wore buckskin pants and custom jewelry (duplicated for all the guys in the wedding party) by Royal Peasantry. 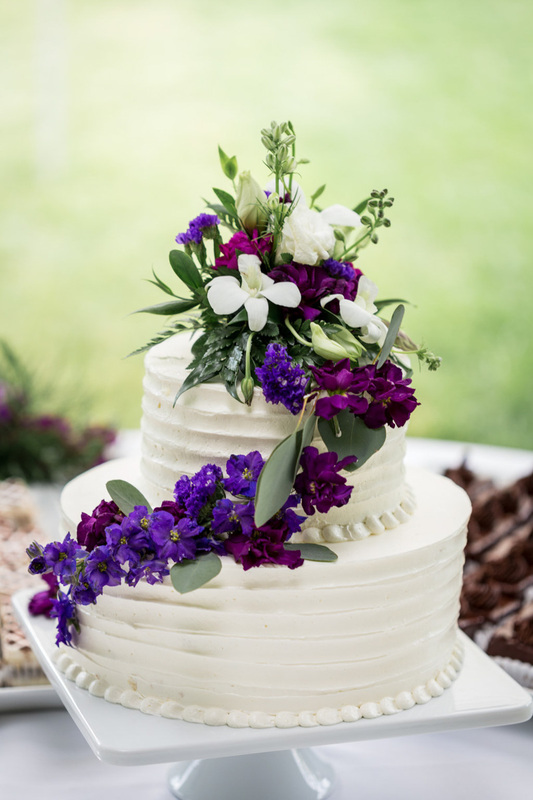 Beautiful flowers by Kaylynne’s Briar Patch, dinner catered by local favorite 12 Bones, and luscious desserts by Old Europe. 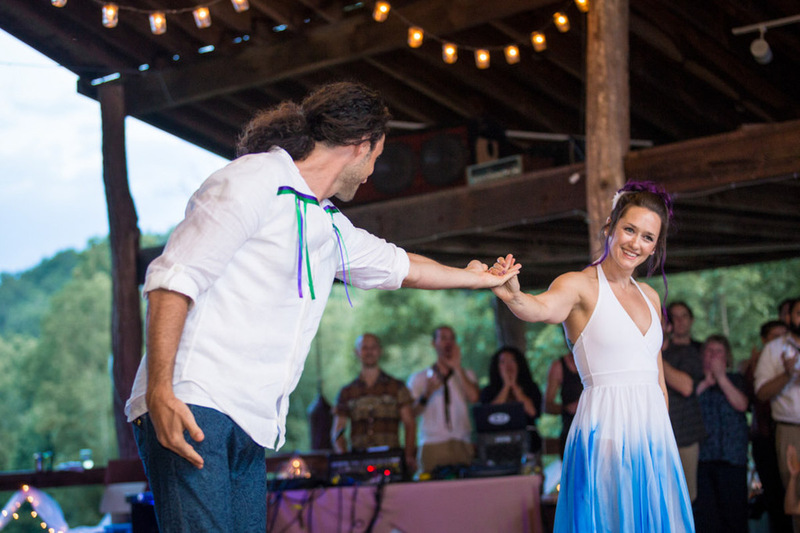 The night was capped off by a truly stunning intimate performance by members of Elephant Revival Family, and Cassie and Brady debuted a choreographed first-dance number that made us all laugh *and* wipe tears from our faces. 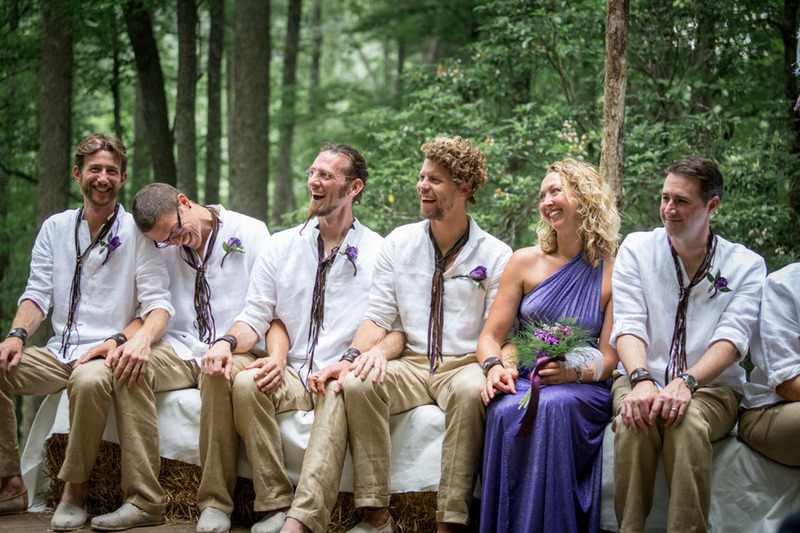 But the best part of the day by far was the abundant love between these people that wrapped everyone up in its arms and made us all feel like family. 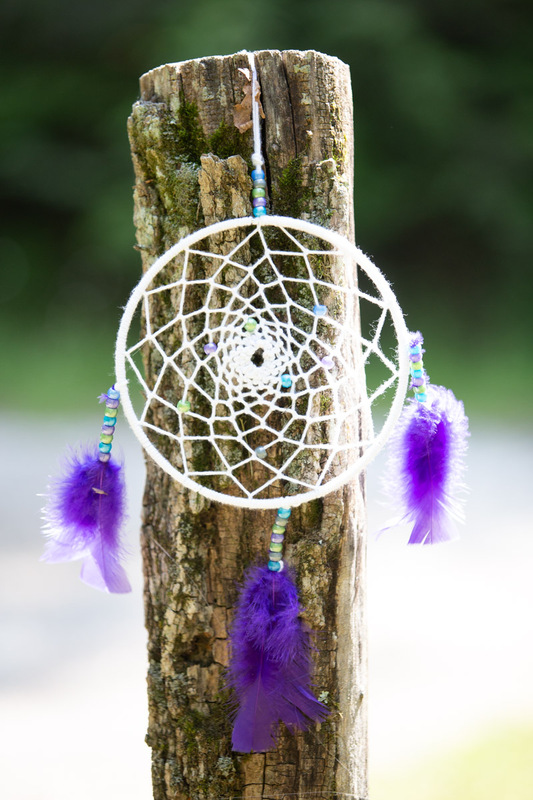 Aho!